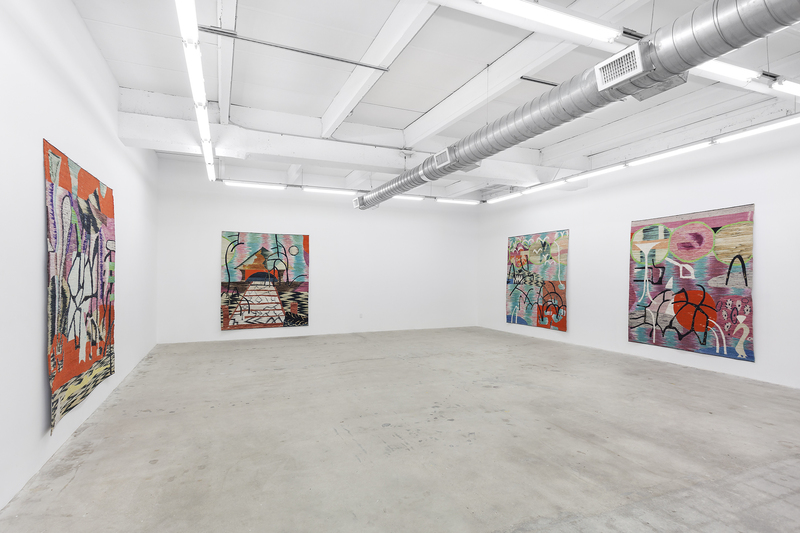 Depicting cranes, flies, and water-side dwellings, Mexico City based artist Yann Gerstberger’s newest suite of works seemingly appropriate regional elements for his second solo show in Miami with Michael Jon and Alan. While the Central American and southern U.S. influences are quite evident in their initial appearance as native rugs or tapestries, Gerstberger’s use of modern approaches create quite complex compositions upon these surfaces. 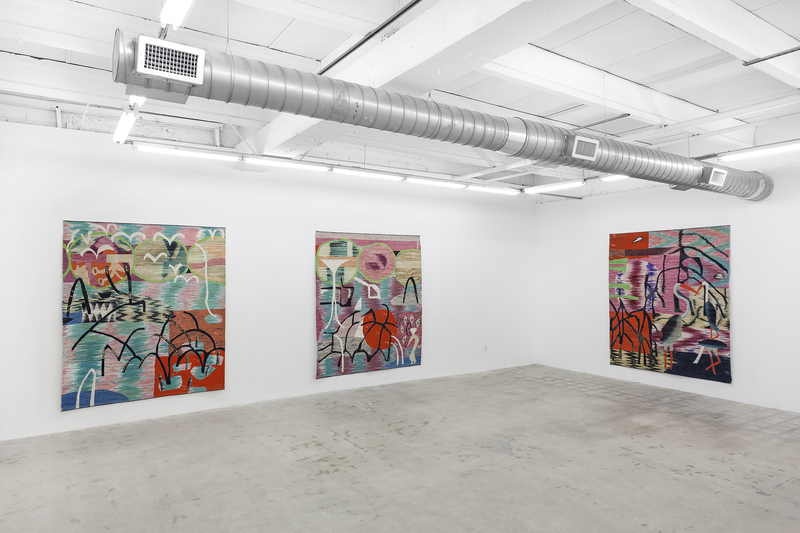 Entitled “Travis,” the show exhibits seven of Gerstberger’s most recent pieces, distinct in their topical hues--serving as another fitting connection to the collection’s presentation in Miami. However, despite the freshened palate, Gerstberger’s works remain easily identifiable due to his recognizable blend of familiar media combined with a unique use of cubist and primitivist styles. Like in past iterations, these pieces show a healthy mixture of intermingling, overlayed and juxtaposed organic forms of varying colors and patterns, open to interpretation. The few exceptions being the architectural rendering of a simple hut and the contour representations of various birds. The imagery overall can be most likened historically to Picasso and Miro or more recently to 80’s and 90’s era graphic designs. Aided through the animalistic references and staccato patterns, the collection also displays a keen sense of movement, representative of both his subject matter and weaving process. 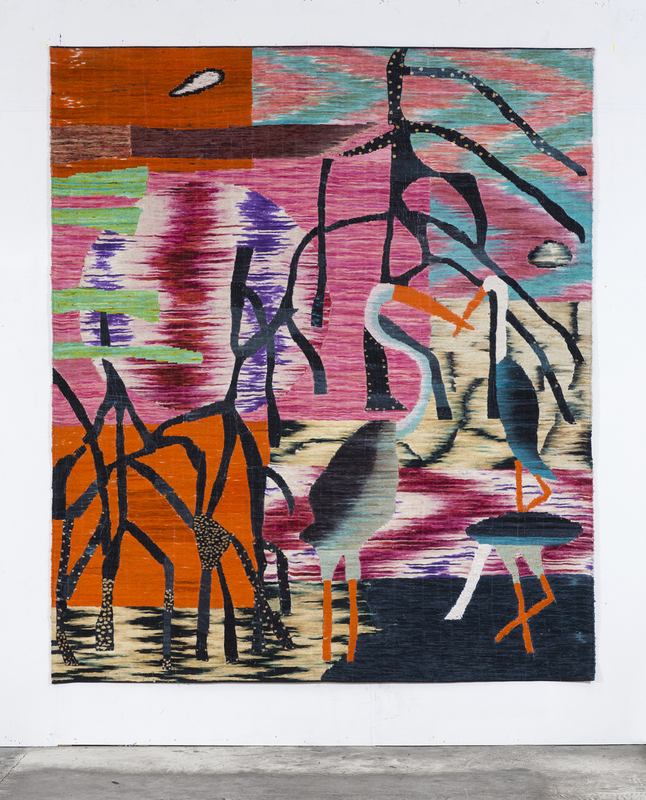 The tapestries themselves, being bound by both naturally and synthetically dyed cotton yarn and sewn onto reclaimed vinyl, present Gerstberger’s Mexico as newly industrialized country that remains rooted in tradition. The resulting pieces are simultaneously contemporary and indigenous. Through his limbo between primitive and modern styles, concrete and abstract depictions, contemporary and native practices, Gerstberger’s invites his audience to both visually dissect and weave together the notable characteristics of the region's changing visual identity. It is these dichotomies that construct Gerstberger’s rich imagery and make his newest exhibition “Travis” a must see.